Storms can do a lot of damage to your homestead–your plants, animals and property–and hit us without warning. 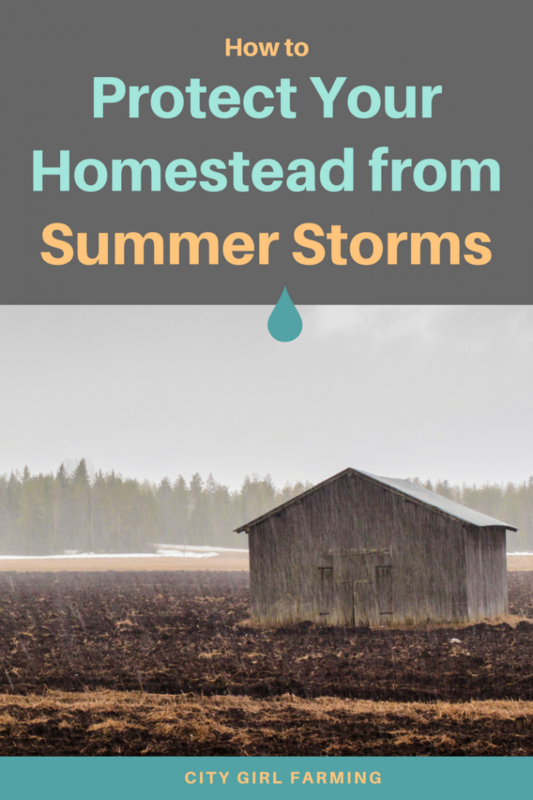 However, there are things you can do to protect your homestead from summer storms before they hit. Here are some tips and tricks. Summer will soon be in full swing, and that means hot and humid conditions for much of the country. These are the perfect conditions for severe thunderstorms. When a storm hits, you have so many considerations: guarding your plants, keeping animals safe, and of course protecting your family. Read on to learn how to protect your homestead and prepare it for severe weather this summer. With severe storms come damaging conditions including high winds, heavy rain, lightning, and hail. You could lose a few plants or an entire garden with one bad storm. Here are some ways to protect your precious plants! Heavy rains can easily wash away soil, and your plants need that soil to live. Head this danger off by putting down mulch or another material that will offer a protective layer to the soil. It’s also important to make sure all that rain has somewhere to go. You can use advanced methods such as digging an underground drain in your yard, or you can simply build up the soil in your garden to create a path for the runoff. Another great option is a rain garden – a separate garden with deep-rooted plants to soak up all that rain – or a pond. 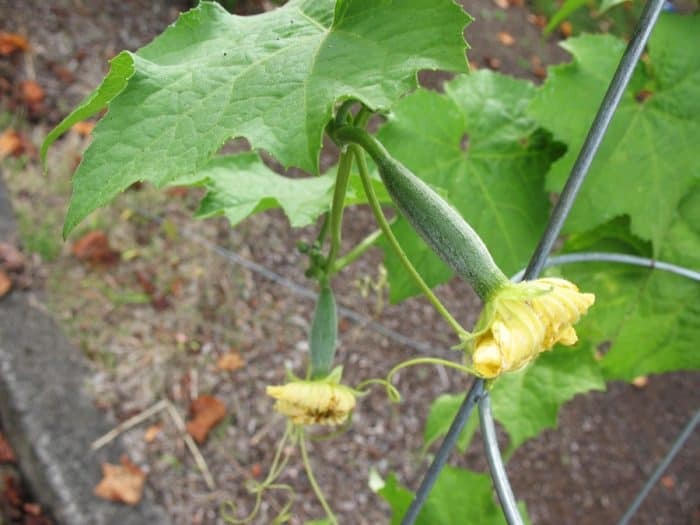 Hail is one of the most devastating conditions for plants, especially tender young ones. The best way to guard against this is with a row cover, which you can buy at most gardening stores. You can also make one yourself. All you need is a covering (for example, an old tarp) and some PVC pipes. If you don’t have these materials on hand and a storm is looming on the horizon, then by all means improvise! Put a potting plant or a plastic bucket over the plants. Just make sure whatever you use is sturdy enough to hold up to wind, or is anchored in some way. A fence is the best way to protect your plants from the wind. Make sure your fence has gaps in it to allow some airflow. A solid wall will actually not be as effective as one with slats. Alternatively, you could rely on trees or hedges to provide some protection. And as for protecting those trees and hedges or shrubs, the best thing you can do is to keep them neatly pruned to prevent branch breakage. You also have to consider your animals in the case of a storm. How you prepare your furry friends for severe weather depends on what types of animals you have. While you may be able to shelter cats and dogs indoors, you certainly can’t do this for a cow or horse! Your first instinct might be to secure your large animals in the barn. Don’t do this! In the event of a tornado, they will become trapped and may even be injured by debris or a collapsed roof. Large livestock should be turned loose in an enclosed pasture. Ideally, they will have high ground to run to in case of flooding, and tall trees to protect them from the wind. Even if you don’t have these conditions on your land, outdoors is still safer for them than an enclosed space. For small pets, indoors with you is definitely the safest place. Cats, dogs, and rabbits are all easy to bring indoors. For chickens, this is a little trickier. If you have enough time to prepare a safe area for them, bring your chickens indoors. You could set up a space in the garage, kitchen, living room – anywhere you can put up an enclosure and give them some room to roam. 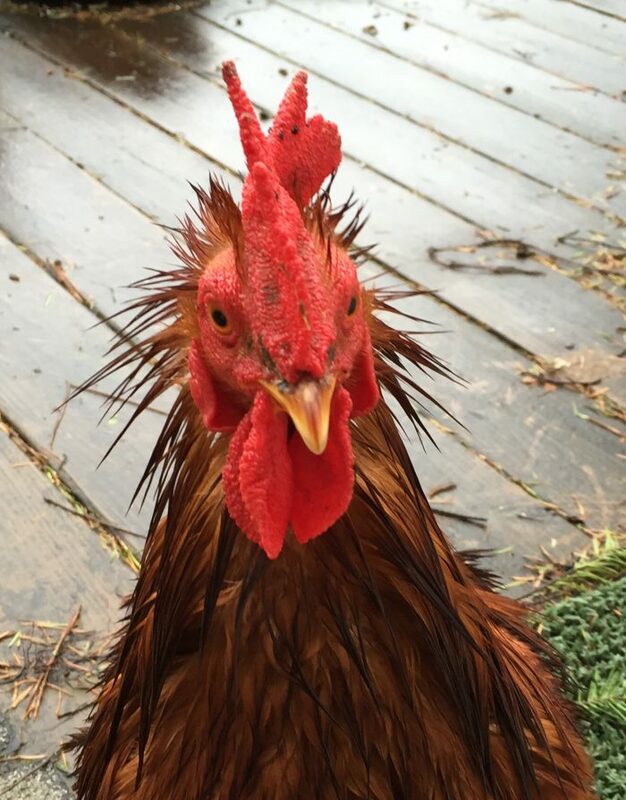 Otherwise, they should be fine outside, but you may want to anchor the coop somehow or invest in a sturdy structure that will hold up to winds. Do make sure to regularly inspect the area around the coop to make sure there are no branches or other debris that could become dangerous in the event of high winds. Always keep an emergency first-aid kit, plenty of feed and water, and the vet’s number handy. Check on your animals as soon as the storm passes, but NOT while it’s still passing through. Your safety comes first! If storms get severe enough, you could be facing a power outage of a few hours or even a few days or weeks. This doesn’t have to interrupt your normal life. Homesteaders are independent creatures, and there’s no reason you can’t generate your own power! Here are some ideas for surviving a power outage on your homestead. Most people reach for flashlights and candles in the event of a power outage, but there are other options too. A solar light is a great renewable source of lighting, provided you receive adequate sunlight where you live and remember to charge it during the day. Oil lamps don’t require any charging or batteries, just oil or kerosene. You can really get creative here if you don’t have lamp oil or kerosene on hand – these lamps will even run on olive oil or animal fat! If you have a well, chances are it’s powered by an electric pump. So when the power cuts out, you can’t get to your water. But you can always be prepared with a hand pump! These come in shallow well models, which need to be primed before use, or a deep well pump that requires no priming. A shallow well pump works with water that’s within 20 feet. Anything deeper than that, you need a deep well pump. If you don’t have a pump, then a bucket is another option. There are special galvanized buckets you can buy for this purpose since most buckets lying around the house probably won’t be narrow enough to fit inside the well. There are various non-electric cooking sources you can use if you’ve bought them ahead of time. A charcoal grill, fire pit, and wood stove are all great options. If you don’t have any of these, you can fashion your own solar cooker out of cardboard, glue, duct tape, and aluminum foil. Just be sure to measure the temperature of your food with a cooking thermometer in several places, since solar cooking is a less predictable method. Another consideration is the container you’re doing the cooking in. Cast iron works best for a flame heat source. If you don’t own any cast iron cookware, aluminum works in a pinch. Other appropriate materials include steel and ceramic or clay pots. Depending on where you live, severe storms might be few and far between, or a normal occurrence. Regardless, it’s important to be prepared because, by the time a storm does hit, it will be too late to make preparations. Learn how to protect your plants, animals, and homestead, and a summer storm won’t pose such a threat. Glenda Lehman Ervin is the daughter of the founder of Lehman’s, a retailer in Kidron, OH, where she serves as VP of Marketing. Lehman’s mission is to supply goods for living a simpler life. Step by step, we are all on the path to a meaningful, satisfying life, and Glenda is thrilled that Lehman’s can be a part of that journey. She lives in the woods just a few miles north of the family store with her husband and two children, along with their two cats and a guinea pig named Winston Churchill. You can find more supplies for your homestead, garden, and animals on Lehmans.com.